Lawrence Watt-Evans was born and raised in eastern Massachusetts, the fourth of six children in a house full of books. Like his parents, he was an inveterate reader and enjoyed science fiction and a wide variety of speculative fiction. His first attempts at writing science fiction were made at the age of eight. After surviving twelve years of public schooling, he followed in the footsteps of father and grandfather and attended Princeton University, taking a break which he spent working in ladder factories, supermarkets, fast-food restaurants and selling door-to-door. Before returning to Princeton, he began trying to sell his writing without much success. He left Princeton before he received his degree and produced a fantasy novel, The Lure of the Basilisk, which sold readily to Del Rey Books, beginning his career as a full-time writer. It was followed by three sequels and the series for which he is best known, the Ethshar fantasy series. A prolific author, his other fantasy work includes the short novel The Rebirth of Wonder and the humorous collaboration with Esther Friesner entitled Split Heirs. In addition to fantasy, he has written one horror novel, The Nightmare People, and several science fiction novels, of which The Cyborg and the Sorcerers has been the most popular to date. His personal favorite is Nightside City, a 24th-century detective story. On the borderline between science fiction and fantasy is his Three Worlds trilogy: Out of This World, In the Empire of Shadow, and The Reign of the Brown Magician. His novels have been translated into seven languages and enjoy worldwide popularity. He has also written and sold over a hundred short stories, been nominated for a Nebula, and has won the Hugo award. His stories have appeared in every major science fiction and fantasy magazine and numerous comics. 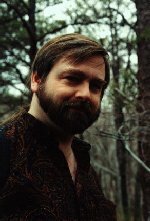 A half-owner of the horror magazine Deathrealm before its recent demise, he served two years as president of the Horror Writers Association from 1994-1996. He is married, has two children, and after living in Pittsburgh and Kentucky is now firmly settled in the Maryland suburbs of Washington, D.C. His latest novel, published in November is a Tor hardcover entitled Touched By the Gods, perhaps his most ambitious novel yet. We talked with Lawrence about his latest book, his passion for his work and his thoughts on the science fiction and fantasy genres. How did Touched By the Gods come about? As I explain on my Web page, I read a fantasy novel about which my then-publisher wanted me to say something nice they could put on the cover, and found myself noticing Stuff the Author Did Well, and Stuff the Author Screwed Up. I decided to see if I could write a big fat fantasy novel that had the same virtues without the annoying flaws. Incidentally, I didn't -- Touched By the Gods changed shape as I worked on it, and wound up very different, lacking at least one of the things I liked about my inspiration. It has its own virtues, though. Do you see Touched By the Gods as a stand-alone epic or the beginning (or end) of a series about this world? Stand-alone -- but I could probably be convinced otherwise. The Domdur Empire's a pretty nice place. Have you thought about doing a prequel to Touched by the Gods? I've thought about it, yeah -- after all, there are all those other champions. I don't know if I'll ever do it, though. How did you create the character of Malledd? I thought about what traits the gods would want in their champion -- strong, tenacious, brave but not foolhardy, willing to make sacrifices -- and then imagined what that person would turn out like if he'd grown up convinced that this whole champion business was a bad idea. That's Malledd. One of the fascinating aspects of the Touched by the Gods world is its polytheistic nature with Gods who actually tell the oracles what they want people to do and show up at marriage ceremonies and the like. Did this premise create any special challenges in the plotting or writing of the novel? In a way, yes; I had to establish that the gods do have rules and limitations, or else the threat to the Empire couldn't be taken seriously -- but the human characters don't know what those limitations are. It was a bit tricky. How do you go about creating the magic and rules for a new fantasy universe? I ever started to plot a story; for my current work in progress, Dragon Weather, I'm five hundred pages into the first draft and still haven't decided exactly how the magic in that world works (though I'm getting there). For Touched By the Gods I knew from the first that I wanted my hero to be divinely appointed, so I started out with the priests and oracles -- I wrote the prologue before I knew much about the Domdur Empire or the Hundred Moons, and let the whole thing develop from there. For Ethshar, though, I worked out the laws of magic and the history of the World before I had any idea what stories I wanted to write. In every case, though, I try to fit everything together so it makes sense. I need to provide a reason that magic isn't so widespread that the world's unrecognizably alien, for example -- in the Domdur Empire it's because the gods regulate it, in Ethshar it's because it's bloody dangerous, tricky stuff that only people with a natural talent can use, and so on. Rumor has it that you have laid down the law on fantasy writing. What are your top two Laws? Ah. A decade or so back I was asked to write a guest feature for Starlog, and wrote "Watt-Evans' Laws of Fantasy." There are six of them. I'd say the two most important are: Watt-Evans' First Law of Fantasy: Stories are about people. and Watt-Evans' Fifth Law of Fantasy: Magic, like everything else, has rules. Laws Two through Four are really almost corollaries of the first, so I suppose I could revise them down to three. What are your pet peeves when reading fantasy novels? Impossible economics -- for example, huge cities in the middle of the desert; where do they get their food? Villains who are evil just because they are. Idiot plots, especially the classic one where the hero who has the all-powerful magical widget can't bring himself to use it, and instead watches his friends get slaughtered by the bad guys for a couple of hundred pages before finally getting fed up enough to zap the villain. Invented civilizations that have no visible ties to our reality, but which somehow evolved certain identical structures -- medieval Catholicism, or Latin names, or whatever. Bad rewrites of Celtic myth. When you are not reading fantasy, what else do you like to read? Mysteries, history, sea stories... lots of stuff. I understand that you are part owner of a tavern. Tell us about that. It's a brewpub, actually -- the Olde Towne Tavern & Brewing Company, in Gaithersburg MD. "When I was in second grade, my teacher praised a writing assignment I'd done and said maybe I'd grow up to be a writer and the idea just hit me as the most wonderful thing I'd ever heard." When my mother died, my share of her estate was in the mid five figures -- mostly because she owned a big old house in the suburbs of Boston, and the mortgage had been paid off long ago. My wife and I looked for someplace to invest the money, and right at that time Chuck Covell, a builder who's now general manager of the tavern, was looking for investors -- he'd acquired the Belt Building cheap at auction and wanted to turn it into a microbrewery and restaurant. The Belt Building was built in 1903, as a hardware store with a hall for rent upstairs. It was an auto showroom for awhile, and a pizza parlor -- it's a nifty old place. We talked to Chuck, and found he'd really done his homework -- he'd researched the project thoroughly, studied every brewpub in the U.S. to see what worked and what didn't -- so we signed on. It took a couple of years to get all the financing put together and all the permits in place, but the tavern's been open and thriving for about three years now. Our brewmaster, Joe Kalish, has been in the beer business for decades, and we've encouraged him to experiment a little, so we've got a full line of regular beers -- mostly English-style ales, actually -- and also seasonal ones and odd variants that Joe's come up with for a change of pace. My personal favorites are the India Pale Ale and the porter; if you're used to American beer the amber would probably be the best choice to start with. They're all good beers, though, which is a relief -- I'd have been seriously dismayed if we'd put all that money in and the beer was lousy. I've tried the beer at several brewpubs, from New Hampshire to the Carolinas, and never found any noticeably better. The food's really good, too. We only own about two and a half percent, by the way -- an operation like that took a lot of capital to get started. Chuck's hoping to expand and start selling the beer off the premises, too. When I was in second grade, my teacher praised a writing assignment I'd done and said maybe I'd grow up to be a writer, and the idea just hit me as the most wonderful thing I'd ever heard. I had a short-short called "Paranoid Fantasy #1" in the August 1975 issue of American Atheist. I'd submitted it as a joke -- their entry in Writer's Market said they bought fantasy, so I figured, why not send them something? And they bought it. 2.5 cents a word. I'd sold some features to a local newspaper before that, back in 1972, while I was still in high school. What do you like best about fantasy writing? The freedom and challenge of building an entire new world. Do prefer writing fantasy over horror or sf? Why? Actually, no. I write more fantasy because at least for me, it pays better than SF. I'd prefer to write both in roughly equal amounts, with an occasional horror story as a change of pace. I don't want to get into a rut. Let's talk about comic books now. It seems as if comic books are more popular than ever. Why do you think that the comic book has remained such a mainstay of American reading? "A decade or so back I was asked to write a guest feature for Starlog, and wrote "Watt-Evans' Laws of Fantasy." There are six of them. I'd say the two most important are: Watt-Evans' First Law of Fantasy: Stories are about people. and Watt-Evans' Fifth Law of Fantasy: Magic, like everything else, has rules." It hasn't. Comic book sales collapsed over the past five years and are currently at the lowest level they've been since 1938. Which is a shame, because there's some absolutely brilliant work being done in comics nowadays. The existence of the "direct market," the distribution system that supplies comic book shops, has made it easy for small publishers to survive at sales levels that would have been utter disasters twenty years ago; as a result, even though sales are way, way down, there are hundreds of titles being published and a huge variety of material. But Marvel is in Chapter 11 bankruptcy. DC is only marginally profitable if you don't count the licensing of Superman and Batman. A genuine American art form is in serious economic trouble. I understand you are part owner of a comic book store. How did that come about? A friend of mine had been managing someone else's comic business for years, and finally decided to start his own shop. He needed financing, so he asked three of his friends to help out, and we did. The result is Beyond Comics, which opened this past March at Lakeforest Mall in Gaithersburg. It's a chance for us to see if we can run a comics shop RIGHT. As a former President of the Horror Writers of America, what do you feel has been the greatest benefit you have received from your association with the HWA? It's provided a way to network with other horror writers, to make friends, to do business -- I've made several anthology sales I wouldn't have made if not for HWA, and met a lot of cool people. It's a pleasure to have somewhere I can expect to find people whose interests and sense of humor are as twisted as my own. What trends do you see in the fantasy genre right now? Alas, too many Robert Jordan imitators. Any time one author is really hugely, obviously successful, there will be imitators. I don't see much really good or really original work being done. Funny fantasy and urban fantasy have both sort of faded out, and we're getting a lot of the same old same old. I expect this will break some time in the next couple of years, but I have no idea when or how or what the new trend will be. In your opinion, how has the Electronic Revolution affected the sf and fantasy writing worlds? It hasn't yet, but it certainly looks as if it will -- on-line published and on-line bookselling are both in their infancy, but likely to become very important indeed in short order. Do you believe that the Internet is a positive tool for writers? Why? Being able to contact editors and my agent by e-mail is a wonderful time-saver. And the Web is a great research aid. What advice do you have for someone just starting out in the fantasy genre? Write novels, not short stories -- that's where the money is. Write about characters you'd like to have dinner with. And don't quit your day job. Tell us about the projects are you working on now. As I mentioned above, I'm five hundred pages into Dragon Weather, a big fat fantasy novel that is almost a mirror image of Touched by the Gods in some ways. In TBTG the villain was driven by revenge; in Dragon Weather the hero is. In TBTG the gods were real and immanent; in Dragon Weather the gods are dead. Arlian, my protagonist, can't hope for divine intervention as he seeks to avenge the crimes committed against his family. Arlian's world is one where dragons once ruled the Lands of Man, but they have now retreated into deep caverns. Magic is a dangerous, wild force that's found mostly in the Borderlands. The Lands of Man are fairly anarchic, ruled by wealthy sword-wielding nobles -- nobility is bought, not inherited. Arlian is sold into slavery early in the story, and must work his way up from there until he can challenge the nobles who wronged him -- and the powers behind them. I've also got some short fiction in the works, but I don't know which will get finished and sold. If a sorceress appeared in front of you right now and granted you three wishes, what would you wish for? I'm afraid I'm going to be obvious about it: To never be in worse health than I am right now, to live until I choose to die, and to have fifty million dollars.